It's easy to keep your business details and company logo on the tips of every one's tongues here at Calendar Lady Promotions and our Customised Golf Score Cards from our Golf Department are an excellent and useful promotional item. Our Customised Golf Score Cards are Golf Score Cards with a card handicap chart and a plain pencil. Just decide how many you require and we'll take care of the printing. To find out more about our Customised Golf Score Cards click here and fill in the contact form and we'll get straight back to you. 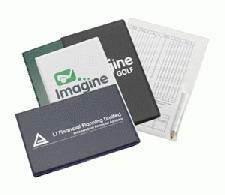 Other promotional and personalised items besides our Customised Golf Score Cards click here.